Automate your reconciliation process and derive real business value. Under MiFID II, reconciliation is mandatory. But reconciling does not need to be complex or just another regulatory obligation that gives you no value. 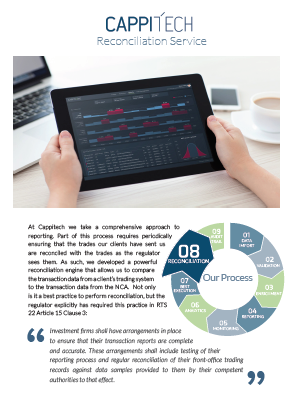 At Cappitech, we make it simple for you to run reconciliation all the way from your trading systems to the regulator's data. We also enable you to use your reconciliation process to gain business insights and improve your operations. Download the Cappitech Reconciliation Brochure to learn more.